This recipe is for Peggy who reminded me that I have not yet posted a Trinidad stew chicken recipe.I wonder what I have been waiting on.This post completely evaded me. Thank you once again for the reminder. In Trinidad when we say stew we are generally referring to stewing meat in browning made with brown sugar and a little oil which leaves the meat with a brown colour that is very tasty. I love to stew and I love to stew any kind of meat: chicken of course, beef, ox, goat, lamb, pork, agouti, any meat I can get my hands on. The colour and the flavour of stew meat, to me, is above any other way of cooking meat. I prefer to stew my meats from scratch without that ready-made browning that you could buy in any super market. Originally in making browning, oil was placed in a deep pot to heat and a favourable amount of sugar was placed in the oil to simmer and melt. When the correct colour was attained water was poured over and used to cook meat. This method for some people was almost “skin threatening” because you could get burned badly while pouring in the water. Recently, health professionals condemned this method and said we should instead stew our meat with little or no oil. How is this done? Place a deep pot on a fire and heat it. 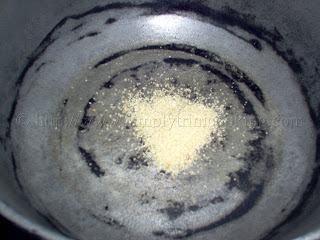 When hot, place a favourable amount of sugar (not too much or the stew could turn black) in the pot and allow to melt and bubble a little (and be careful it does not dry and burn). It should look golden brown and then a generous amount of water is added to make a brown liquid.No oil is necessary, because the meat has its own oil. 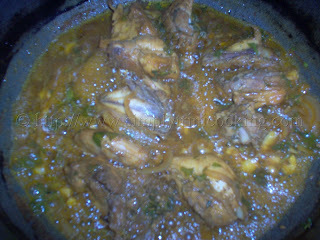 This method is not as dramatic as the original method when the water is added to the hot oil and sugar but nevertheless taste is not compromised. Sometimes the brown liquid (without the oil) would be bottled and stored for later use. 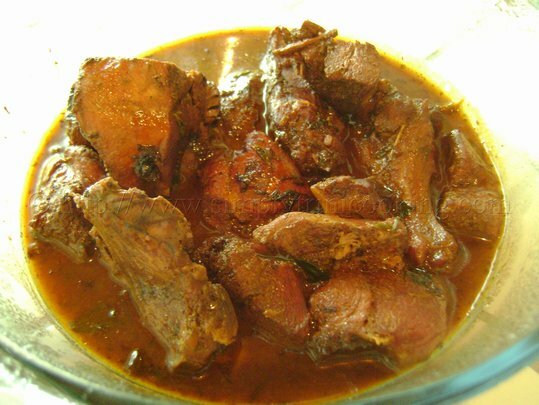 I have met some people who still brown meat according to the original method.I myself like to do it the original way at times but lately I’ ve really become a little health conscious and stew without oil. Now, this stew chicken recipe is just the tip of the iceberg. 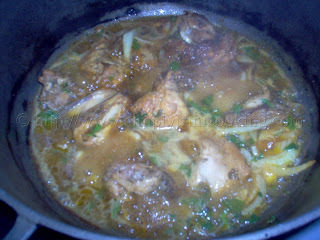 We Trinis like to add other ingredients to this basic stew chicken recipe and make it a complete meal. The ingredients I’m talking about are potatoes, baigan (eggplant), pigeon peas, or any peas for that matter. Lately I’ve been using black beans and found that it really goes well with the stew chicken. Caution must be made not to “over brown” the sugar or the browning will be too dark and taste bitter. This is perhaps why some people buy ready-made browning at the supermarket so they don’t go through the hassle of trying to make it themselves. Here I present to you now the healthy way to stew without oil. Enjoy! Heat a deep heavy pot on a medium fire. Add the sugar to the pot. Allow it to melt and simmer until it looks golden brown. Next add the marinated meat and 1/4 cup 0f water. Allow the browning to coat the meat evenly. Lower the heat and allow to simmer for 2 mins. 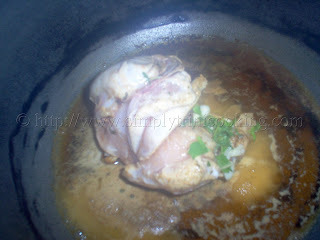 Add 1 1/2 cups of water to just about cover the chicken. 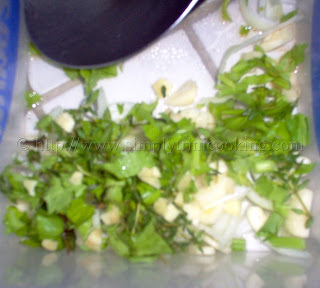 Add salt, pepper and chopped herbs. Cook until the meat is tender (about 25 – 30 mins). You may add a teaspoon of tomato paste for taste. Here ends another exciting Trini recipe. Coming up in my next post I’ll show you how to prepare a snack from a tree that grows right in my backyard. Previous Post: « I’ve Really Been Busy ! Sounds good to me! I’ve never tried any food from Trinidad before. You should try it. It’s a different world of taste. My grandmother would add the chicken directly to the browned sugar and once the chicken was coated she would then tip a small amount of water into the pot and cover for it to simmer. During the chicken coating process she was constantly stiring and turning the chicken. That’s the way I also do it sometimes as well but it requires a little more skill than to just throw in the water to stop the caramelizing process and then add the meat. You really have to know what you’re doing :). 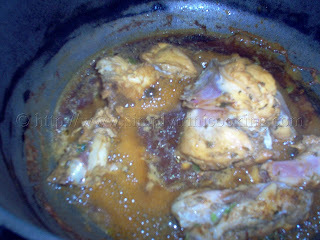 In any case, from experience, both methods ( water before or after) realizes the same delicious stew chicken. Thanks for your comment and do stop by again. how do i cook a mean stew goat? do i follow the recipe like the stewed chicken and substitute goat for chicken? or is there a technique i don’t know about? For the goat you will have to pressure cook it first before stewing and instead of using water while stewing the goat use the stock. Now that you mentioned it I will have to do a stew goat for you to see. I already did curry goat. thank you! 🙂 looking forward to it. Have you all ever eaten macaroni and cheese with liver…it is divine. Would dare someone to put that recipe out there.